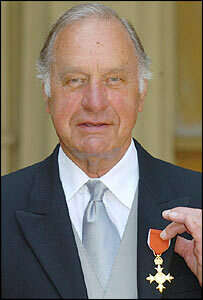 Actor Geoffrey Palmer and author Leslie Thomas have been made OBEs by the Queen at Buckingham Palace. She asked As Time Goes By star Palmer how long he had been acting. "I have been doing this for 55 years now so I have had quite a long career," he said. It was the Queen's first public appearance since being struck down by a heavy cold earlier this week. Mr Thomas, author of The Virgin Soldiers, joked: "I said to her 'how good of you to turn up.'" He added: "She's not been very well and she is nearly 80 - which is not young. "But she was fine. She asked about my writing. Getting this award is a thrill - it really is." Thomas, 74, has written more than 30 books since the success of The Virgin Soldiers in 1966. Palmer's wife Sally and daughter Harriet joined him at the ceremony on Wednesday. He said his family was "probably more excited" about the honour than he was. "One of the most extraordinary things is the number of calls (that came) when it was announced from people I thought were dead and buried," Palmer said. "It was good to hear from them." The London-born star took up acting when a girlfriend persuaded him to join a local amateur dramatics society. He landed his first TV role in 1957 comedy The Army Game, and found fame in 1976 playing Jimmy, the eccentric brother-in-law to Leonard Rossiter's Reggie Perrin. 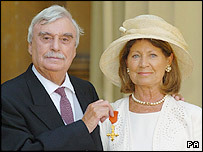 Two years later he appeared in the hit Carla Lane sitcom Butterflies playing Wendy Craig's husband. Another of Mr Palmer's popular TV roles was as Lionel in BBC sitcom As Time Goes By starring opposite Dame Judi Dench. He was also in the film about the life of Queen Victoria, Mrs Brown, starring Dame Judi, as well as the award-winning movie The Madness of King George.